For more than fifty-two year following the assassination of President John F. Kennedy, opinion over the Warren Commission report continues to be divided. Researchers continue the effort to find the truth about Dallas and as more time passes, documents once restricted from public view on the ground of national security are being released to the public offering hope that one day maybe America will find out what really happened in Dealey Plaza. One of the biggest problems with the Commission’s report is that the index was poorly written and almost non-existent. 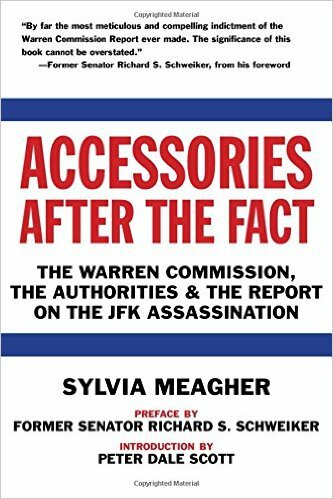 But all of that change with the publication of this masterpiece by Sylvia Meagher and her critique of the Warren Commission report in which she exposes the endless amount of contradictions and flaws and the ineptitude of the Commission, FBI and Dallas Police Department. And the index she compiled is still used by researchers to this day. Performing with the precision of a seasoned surgeon, Meagher carefully dissects each section of the report, raising pertinent questions, some of which remain unanswered to this day. She does not make any assumptions as to who did shoot Kennedy and J.D. Tippitt nor does she attempt to provide a “smoking gun” about the crimes that day. However, Meagher did call for the release of more documents and a new investigation to reveal the truth about that day in our lifetime. We shall hope that day does come, but if it does it will far too late for Meagher, who died on January 14, 1989 at the age of 67 at St. Vincent’s Hospital in New York City from complications of the flu. Had she lived, I believe she would have been thrilled to see Oliver Stone’s ‘JFK’, the film which renewed public interest, resulted in the JFK Assassination Records Collection Act of 1992 and vindicated Jim Garrison in his belief that elements of the United States intelligence apparatus played a significant role in murder. The book is a magnificent piece of work which should be read by anyone interested in the truth about the murder of John F. Kennedy. Posted on February 1, 2016, in Assassinations, JFK and tagged JFK. Bookmark the permalink. Leave a comment.